What Is Your Digital HID™ (DHID™) Project’s Economic and Environmental ROI? Upgrade your existing High Intensity Discharge (HID) lighting system with a Digital HIDTM (DHIDTM) ballast retrofit solution today; the initial buying cost is low, the energy savings are instant, and you can re-use your existing high bay fixture or outdoor luminaire. The GloGreen DHIDTM retrofit ballast solution and accompanying fixture and lamp products help you realize your project’s optimal Return On Investment (ROI) time, and with very little impact had on the environment. Below is an example of the typical economic and environmental ROI on the upgrade of an existing 400W magnetic (core and coil) based fixture with the GloGreen 250W DHIDTM solution. The installation is simple, you only need purchase and install a GloGreen 250W DHIDTM ballast and matching 250W Pulse Start MH or 250W HPS lamp. Your existing fixture is upgraded and performs much better in terms of lighting output, energy efficiency, lamp life performance and sustained lumens, which means lamps stay bright over their entire life (eliminating 2-3 or more lamp changes for years and years of low cost operation). In this example, the Net Total Payback is only 1.08 years. That is a RETURN ON INVESTMENT of 970.8%! Economically the customer is able to realize a PROFIT; environmentally the Elimination of Harmful Emissions as a result is invaluable. Please do not hesitate to contact us today to discuss your solution, or please submit the Risk Free Trial Unit Form for more information. Copyright © 2009-2012 Anthony Borges. All rights reserved. AURA Long Life Light technology is the perfect complement to Accendo’s Engineered Lighting Solution family. The Long Life Lamp solution is proven, and partner customers Worldwide already benefit from the Energy and Money Savings that Long Life Lamps and Accendo Digital HIDTM (DHIDTM) lighting products provide. 48,000hrs+ Fluorescent T5 and T8 lamps, and 70,000hrs+ HID lamps reduce energy consumption, and greatly reduce labour/lamp costs over the really long term. T5 ECO SAVER – insert this lamp into your next T5 relamping project, progressive companies like IKEA already are: ACCENDO-AURA-T5-ECO-SAVER-Long-Life-Fluorescent-Lamp-Solution – at 80% lifespan, only <10% failure rate, Guaranteed. With the addition of Long Life Fluorescent and HID products, Municipality and Industry clientele benefit right away with ‘real’ project savings for Industry’s fastest Return On Investment. Introducing the ECO SAVER Long Life Fluorescent product to your next relamping project is a very simple upgrade which yields immediate savings in energy and money; any client already using a substantial amount of T5 or T8 lamps benefits instantly. Accendo offers the most flexible, cost effective, highest performing, and longest lasting guaranteed solutions for any lighting upgrade project today. We continue to innovate our product offerings to ensure the customer has the choice of the most comprehensive solution regardless of application. Please do not hesitate to contact us today for a free assessment of your application. Please visit www.AccendoElectronics.com for additional information, or email info@accendoelectronics.com. 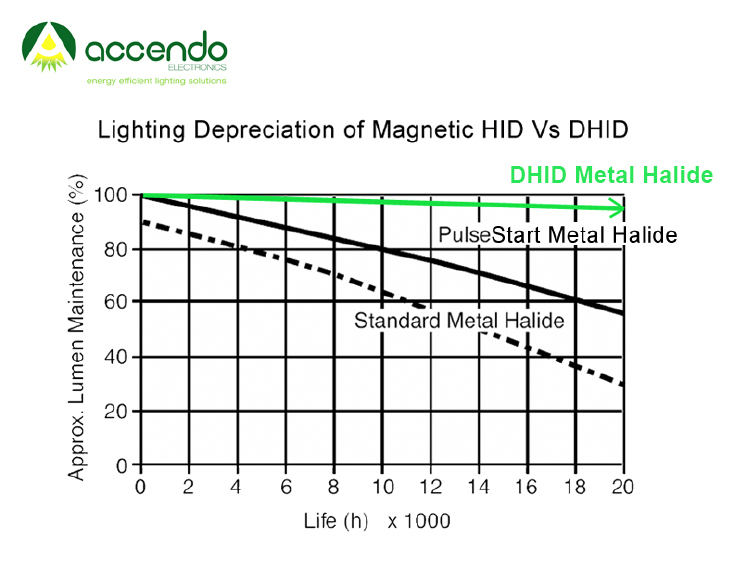 Accendo Electronics is proud to announce the collaboration of Digital HIDTM (DHIDTM) ballast technology with the World’s most advanced High-Intensity Discharge (HID) and Fluorescent Lamps. Ultra long life lamps nearly eliminate the long term costs associated with the operation of HID and fluorescent lighting systems. SODINETTE Long Life High-Pressure Sodium – Up to 70,000+ hours and beyond lifespan with DHIDTM ballast. GLOGREEN Digital HIDTM (DHIDTM) Ballasts – The perfect ballast for the SODINETTE Long Life HPS lamp. ULTIMATE US Long Life T8 Fluorescent – ULTIMATE Long Life fluorescent lamp is the result of intensive research and continuous development efforts. Aura ULTIMATE is a tri-phosphor lamp with the World’s longest service life and an extremely low lamp failure rate. This unique T8 lamp sets the standard for products with an extended lifetime. – Downloadable PDF brochure, click -> Accendo-Aura-ULTIMATE-US-Long-Life-Fluorescent-T8-Lamps – The ultimate long life lighting solution. SUPREME High Efficient T5 Fluorescent – SUPREME High Efficient (HE) is a Long Life fluorescent lamp ideally suited for applications where high-quality, energy-effective lighting is required. – Downloadable PDF brochure, click -> Accendo-Aura-SUPREME-HE-Long-Life-Fluorescent-T5-Lamps – High efficiency T5 lighting for maximum economy. SUPREME High Output T5 Fluorescent – SUPREME High Output is a Long Life fluorescent lamp with a three times longer service life than standard T5 HO lamps. It is the perfect solution when you need the energy saving- and system miniaturisation characteristics of a T5 lamp with the high lumen package of HO in high ceiling applications. – Downloadable PDF brochure, click -> Accendo-Aura-SUPREME-HO-Long-Life-Fluorescent-T5-Lamps – The latest T5 High Output lighting technology for industrial applications. PROTECTOR Fluorescent – Protector lamps are Long Life fluorescent lamps lasting three times longer than standard lamps. The protector function is reached with high quality durable plastic protection film. The plastic film protects critical areas from glass splinters and fluorescent powder in case of lamp breakage. – Downloadable PDF brochure, click -> Accendo-Aura-PROTECTOR-LONG-LIFE – Lighting for protective requirements. THERMO Fluorescent – Thermo fluorescent lamps are designed specifically for environments where the ambient temperature is low. The unique construction contains a Long Life fluorescent lamp cased in an outer glass tube. – Downloadable PDF brochure, click -> Accendo-Aura-THERMO-LONG-LIFE – Lighting for low temperature application areas. REFLECTOR Fluorescent – Reflector is developed for use in applications where a sufficient level of light must be available through direct or indirect reflection. The design with an integral horizontal reflecting layer of 160 ° inside an outer glass tube provides additional more than 60 % of light at the place where it is needed. – Downloadable PDF brochure, click -> Accendo-Aura-REFLECTOR-LONG-LIFE – Lighting for direct and indirect applications. SIGNETTE Fluorescent – Signette is designed to give internally illuminated signs a uniform distribution of light. A 26 mm Long Life fluorescent lamp is contained in a 38 mm diameter outer glass tube. Inside the outer tube are specially designed diffuser layers integrated to give optimised light uniformity both for single- and double-sided signs. – Downloadable PDF brochure, click -> Accendo-Aura-SIGNETTE-LONG-LIFE – Lighting for attractive signage. Please contact us today for a free assessment of your application. Please visit www.AccendoElectronics.com for additional information, or email info@accendoelectronics.com. Digital High-Intensity Discharge (DHIDTM) lighting technology is leading Industry’s energy efficient lighting evolution with a solution to lighting upgrades which is cost-effective, high-performing and the most responsible for the environment. Accendo Electronics Limited, a Canada and United States based lighting manufacturer, is a champion for the economy and the environment and is innovating with the World’s most robust lighting solutions for Industry. Their new GloGreen Series DHIDTM retrofit ballasts and lighting fixtures offer many value added benefits on the upgrade of any outdoor or indoor lighting application. The retrofit upgrade is a simple solution which reduces lighting expenses by fifty to seventy five percent or more, and produces very little waste since existing lighting fixtures can be re-used. It is a known fact that Industry can realize significant money savings by simply upgrading old lighting systems with new more energy efficient lighting; but of greater importance is the reduction in greenhouse gases emitted into the atmosphere as a result. By drastically reducing the electricity demanded from the power utilities by municipalities and industries, a substantial impact can be had on the reduction of CO2 emissions released, and on Industry’s carbon footprint as a whole. Add the option for the responsible reuse of the existing lighting system fixture, and project costs can be further reduced while putting even less of an effect on the environment. The environment wins and your project wins considering DHIDTM lighting offers the perfect balance of buying cost, performance and low operating/consumable costs over the long term for a favorably short return on investment time. High-Intensity Discharge (HID) bulb lighting is a trusted technology; it has been in use around the world for decades and today remains the most widely used type of high-power lighting for outdoor and indoor purposes such as street lighting, factory or retail/warehouse lighting, greenhouse/hydroponics and arena/stadium lighting for example. To power the HID bulb, traditionally a core and coil (magnetic) ballast is used. By simply retrofitting a DHIDTM ballast in place of the less efficient magnetic ballast, an instant fifty percent plus energy savings is possible; e.g. if the existing magnetic ballast light fixture uses a four hundred Watt power ballast/bulb and the new GloGreen ballast using two hundred Watts is installed in-place with a two-hundred Watt bulb, the customer can now expect longer lasting light quality with over fifty percent savings in electricity, and all for a fraction of the cost and waste of purchasing a new fixture. The DHIDTM ballast brings new life to HID bulb systems including the benefits of extended lamp life, increased lumen output, instant-dimming, quick ignition/re-strike times and Automatic or pre-programmed schedule dimming capabilities for maximized energy savings and lamp life. A breakthrough innovation is the guarantee that a HID bulb powered by a DHIDTM ballast will not visibly degrade over its entire lifetime. Magnetic ballast powered HID bulbs are known for their rapid degradation or premature dimming in as little as six months or five thousand hours; this is no longer the case with DHIDTM since the customer can expect thirty to forty thousand hours and beyond life from the same bulb while suffering no more than a five percent drop in light quality and output right up to the end of the bulb’s extended life. Accendo GloGreen Series Digital HIDTM ballasts offer unparalleled electrical efficiency and performance compared to conventional core and coil (magnetic) ballasts. DHIDTM lighting offers the most cost-effective, value-added alternative to LED, fluorescent and induction based technologies for new and retrofit industrial and commercial Green lighting projects. Accendo Electronics Limited is a manufacturer and wholesale distributor of Industry leading energy efficient lighting products who endeavors to help Industry be more competitive by significantly reducing the operating costs associated with lighting. The company is also dedicated to the Greening of the environment with products which demonstrate the least impact had on the environment as a result of a lighting upgrade. Accendo commits to the success of large-scale Green lighting projects with highly integrated off-shore and Canadian based production facilities, complimented by local warehousing, and advanced research, development and technical support facilities located in Markham, Ontario, Canada and Atlanta, Georgia, USA. All products are subjected to a 100% quality inspection and guaranteed with 3 to 5 Year Warranty Terms to meet the most stringent Industry standards. Accendo lighting innovations represent the highest quality with technological superiority in the area of performance and capability, delivering the most energy saving lighting solutions in the marketplace today. On-going research and development programs ensure a mandate of continuously improving upon the core-technology base and on the introduction of new products incorporating a balance of proven and leading edge technologies into product designs. The market leading technology to make Industry lighting applications as economically and environmentally efficient as possible is available today; DHIDTM guarantees brighter, longer lasting light for less cost. Accendo GloGreen Digital HIDTM (DHIDTM) lighting retrofit ballasts and fixtures with Dim Function capabilities are a very smart way to reduce Industry lighting energy consumption and associated electricity costs. The benefits of DHIDTM lighting today are equally environmentally and economically favourable with a really quick return on investment. Upgrading any existing core and coil (magnetic) ballast powered HID lamp system with DHIDTM immediately saves 40%-50% in energy consumption. By instantly dimming an additional 50%-70% of incoming power, total savings over your existing installation can exceed 65%! For example, by upgrading/retrofitting an existing magnetic ballast 400W Metal Halide (MH) HID lamp fixture with a GloGreen 250W DHIDTM ballast and 250W Pulse Start MH lamp, an immediate 43% energy savings are possible with equivalent lighting levels sustained over the long term. The magnetic 400W operating at 15% losses will consume a total of 460W; the GloGreen 250W DHIDTM ballast on the other hand will only consume 265W input power given its much higher electrical efficiency and command of Voltage. The 250W MH lamp outputs 23,000 lumens approximately, which is the equivalent to the output of a 400W MH lamp which has surpassed 5,000-10,000 hours or 1 year of operation (approximately 40% degradation already suffered at 1 year). If the existing magnetic based HID lamp installation has exceeded 5,000-10,000 hours, then the GloGreen DHIDTM 250W solution will be producing equivalent or more light which is sustained over the extended life of the lamp, but at a fraction of the operating cost! To clarify further, a standard probe start 400W MH lamp operated by a magnetic ballast will originally output 35,000 initial lumens. At 5,000 hours of operation, the lamp will have depreciated to 27,000 lumens (23% lumens lost); at 10,000 hours, 21,000 lumens or 40% degradation and by the lamps rated end life of 15,000 hours, the lamp will have suffered 52% lumen depreciation (17,000 lumens). If 1 year operation equates to 8,760 hours (24 hours a day X 365 days a year), then at just 6 months of operation, the lamp will have suffered 23% losses in lumens or light delivered to the ground. The GloGreen 250W DHIDTM ballast system operating a Sylvania 250W Pulse Start Metal Halide lamp (MP 250) will output 22,500 lumens (original specification). Due to the DHIDTM ballast’s high electrical efficiencies and the Voltage control offered by the Direct Digital IgnitionTM (DDI) micro-processor and embedded algorithms, virtually all power (Watts) input into the ballast is converted to output Watts delivered as lumens/light to the target. As a result lumen maintenance is drastically improved and lamp life is greatly extended; the Sylvania MH lamp outputting 22,500 lumens originally will sustain 95% lumen maintenance over its entire extended lifespan. There is no visible depreciation of light over this lifetime, relamping is no longer required; imagine how much you could save by reducing your maintenance and bulb consumable costs by 50%+? – GloGreen Digital HIDTM ballasts are available in Basic (no dimming) and Dim Function capable models. Dim Function models feature a RJ-11 input port which allows for easy plug and play operation of the Accendo Motion Sensor, or Pre-Programmed Device (PPD; used with Automatic Dimming function). – The DHIDTM ballasts can also be supplied with discrete or Analog inputs. The dimming functions are enabled via wired motion sensor (discrete signal input dims the ballast to 50% of full rated ballast Wattage instantly in one step); via wired Analog input of 0VDC to 10VDC (energizing Analog input with 2.5VDC to 10VDC correlates to a ballast Wattage output of 50% to 100% of rated ballast Wattage). Dimming with Analog input is instant and seamless, it is ideal for applications which use Programmable Logic Controllers (PLC) to control building functions; the same PLC’s can be used to direct/schedule the operation/dimming of the lighting network for maximized energy savings. – Automatic Dimming or pre-programmed schedule dimming offers a simple and cost effective means to dramatically reduce energy consumption and increase HID lamp life expectancy. Based on a customer specified dimming schedule, the Automatic Dim function capable ballasts operate independently; when powered on (via photo sensor or switch for example), the ballast automatically runs its program for the day, entering its dim mode only after a specified elapsed amount of time from the ballast ‘on’ or start time. For example, choosing a 5 or 6 hours delay time means the ballast will enter its dim mode at midnight approximately (i.e. if the ballast on time is at 6pm or 7pm that evening). The program is simple, and allows for the selection of 0% to 70% dimming (100% to 30% output of full ballast Wattage). By dimming after hours, when less human and vehicle traffic is present, energy and money savings can be maximized; even in a dimmed state, DHIDTM lighting delivers sufficient lighting to the target as to not compromise safety or security in the area. Dimming HIDTM Lamps Saves Industry Energy and Money. The application flexibility offered by GloGreen DHIDTM lighting from Accendo creates many different ways for you to reduce your lighting costs. Dimming HID lamps by 50%-70% when humans or vehicles are not present makes a lot of sense in energy savings and also further extends the lifespan of the lamp. The upgrade is simple and the return on investment is excellent. With local Power Utilities and Government entities offering substantial rebates on the retrofit or new installation of DHIDTM ballasts and fixtures today, your project is paid off in 6-12 months and with very minimal expenses incurred over the entire lifetime of the system. Please contact us today for a free assessment of your application. Please visit www.AccendoElectronics.com for additional information; or do not hesitate to contact me directly with any questions. Introducing the new GloGreen Series Digital HIDTM (DHIDTM) ballasts from Accendo, the only in the World to offer many innovative cost-saving features including Multiple Bulb Capability; now one ballast can operate either HPS or MH bulbs with equal efficiency for reduced inventory and choice (for Municipality/Industrial applications) and for functionality (Greenhouse/Hydroponics industry). The DHIDTM ballast operates at 97% efficiency and therefore coverts virtually all input power into lumen output (118lm/W luminous efficacy). With very little heat produced, end-users equally benefit with reduced Heating, Ventilating, and Air Conditioning electricity expenses, which is ideally suited to the refrigeration/cold storage industry and greenhouse/hydroponics industry. The new GloGreen Series operates High-Pressure Sodium (HPS), Metal Halide (MH), and Ceramic Metal Halide (CMH) High-Intensity Discharge (HID) light bulbs. Applications include retrofit upgrade and new Green lighting projects for street lighting, parking lot, factory/warehouse, retail, airport, sports field/stadium, greenhouse/hydroponics, aquarium, and solar/wind renewable energy lighting. Accendo Direct Digital IgnitionTM (DDI) micro-processor technology allows for the optimal operation of the HID bulb in two stages; it controls the ignition process, providing a precise soft-strike of Voltage to ignite the bulb to 100% power in 60 seconds (as opposed to 10-15 minutes with traditional magnetic HID systems); it controls and monitors (in a closed loop) the operation of the bulb after it is ignited, ensuring the most efficient consumption of bulb gases. DDI extends the life of the bulb by 100%, and guarantees the light brightness and lumen penetration/throw output will never degrade more than 5% over the entire life of the HID bulb (95% lumen maintenance). With HID bulbs now lasting 50,000 hours or more, costly relamping is no longer required since originally specified lumen levels will never decrease; meaning lamp changes are truly at the end of the lamp’s lifespan. Fully silicon potted for manufacturing and outdoor/wet environments, the GloGreen Series represents the most robust digital ballast solution on the market today. The GloGreen Series is available in 50W, 70W, 100W, 150W, 200W, 250W, 400W, 575W, 600W, 750W, and 1000W configurations for HID upgrade/retrofit applications. The GloGreen Series is available in 120V, 208V, 240V, 277V and 347V Voltages and meets CSA (Canadian and US) and CE (European) electrical certification standards – for more information, please link here: -> Electrical Safety Certifications. In a retrofit application, typically we recommend the substitution of an inefficient magnetic ballast with a DHIDTM ballast which is half of the power rating (for example, a 400W MH bulb system would be substituted with a 200W DHIDTM ballast operating a 250W bulb). Alternatively, Accendo offers GloGreen Series Digital HIDTM ballast powered cobra head street lighting fixtures for new/replacement street, highway and parking lot upgrade applications and DHIDTM powered Highbay fixtures for factory/warehouse, retail, and public space applications. This simple and immediate cost-effective upgrade yields 50%+ electricity money savings. Introduce smart dimming and costs can be further reduced an additional 50% (utilizing a motion/heat sensor – ideal for parking lot applications, warehouses, stadiums, etc.). Dimming by sensor is one-step and by default, when triggered, dims to 50% of incoming power. For example: The DHIDTM 200W would ignite to 200W from the 100W setting instantly when triggered by sensor. After a pre-set time of no motion, the DHIDTM light will then dim back instantly to its 100W state. Accendo GloGreen Series Digital HIDTM ballasts offer unparalleled electrical efficiency and performance compared to conventional core and coil (magnetic) ballasts. DHIDTM offers the most cost-effective, value-added alternative to LED, fluorescent and induction based technologies for new and retrofit industrial and commercial Green lighting projects. The perfect balance of initial buying cost, energy efficiency, light performance and low /maintenance consumable costs over the long term for the most realistic and environmentally responsible short term return on investment. Please do not hesitate to Contact Us for additional details. New GloGreen Series brochures are available (our corporate website is updating soon – please note the GloGreen “M” Series DHIDTM ballast series is now discontinued). New street lighting test results are also published; please see Brochures and Digital HIDTM (DHIDTM) Lighting Test Results under “The Pages” menu to the right. Objective: Comparison of performance between existing 250W magnetic ballast powered cobrahead street light fixture and GloGreen 250W and 150W DHIDTM ballasts retrofitted in the same existing fixture. 95% Lumen Maintenance = No Relamping! The new page to the right highlights the very Green friendly benefits of GloGreen DHIDTM retrofit ballast and GloGreen DHIDTM powered Highbay Fixture solutions. Since GloGreen Digital HIDTM ballast powered HID light bulbs (MH, CMH, HPS) do not visibly degrade over their 40,000 hour and beyond lifespan, GloGreen DHIDTM can truly help you Go Green; helping you reach your environmental challenges while dramatically reducing your overall lighting costs. See this section in the menu to the right for information on how you can build your own GloGreen Renewable Power Light System. Accendo GloGreen Series Digital HIDTM (DHIDTM) Ballast products are designed to work most efficiently with Solar, Wind and other Renewable Power Sources. The DHIDTM ballast operates at 97% efficiency, ensuring that virtually all energy harvested is efficiently output as bright, penetrating light. GloGreen technologies are available Risk Free for a thirty (30) day trial period. Please provide details of your specific lighting application and an Associate will contact you to discuss the recommended energy saving solution and details of the trial. Please do not hesitate to contact us today to discuss your energy and money saving opportunity. Accendo commits to the success of your lighting retrofit/upgrade, or new Green lighting project with high-quality, safety approved products. Accendo products are manufactured to the utmost of quality assurance standards. All GloGreen Series Digital HIDTM (DHIDTM) ballasts undergo a thorough inspection before leaving the factory. The following are examples of test reports completed for the GloGreen Series 50W, 70W, 150W, 200W/250W, 400W, 575W, 600W, 750W and 1000W DHIDTM ballasts. Each individual GloGreen Series ballast must undergo a burn-in period after final assembly to ensure the DHIDTM ballast is operational at its intended specification. Please note, these tested GloGreen Series ballasts can operate either Metal Halide (MH) or High-Pressure Sodium (HPS) bulbs; as indicated, and with equal energy efficiency. One lighting solution can now solve a multitude of applications where quality, long lasting light penetration is essential. By simply retrofitting/upgrading the old core and coil (magnetic) ballast in an existing High-Intensity Discharge lamp system, the application benefits immediately with 50% savings in electrical energy consumption. Economically and environmentally responsible, the GloGreen Series lighting retrofit or upgrade solution is the only to meet all of your indoor and outdoor lighting needs with cost-effective, longer lasting light that will not degrade over time. With DHIDTM lighting products in 50W to 1000W configurations, Accendo is your true one-source lighting solution partner. Where Are GloGreen DHIDTM Lighting Retrofit Ballasts Applied? GloGreen 50W DHIDTM ballast replaces core and coil (magnetic) 70W- 100W ballast – application examples include underground parking, lowbay factory/warehouse (<15ft), street lighting, outdoor parking lot lighting, wallpack/building perimeter lighting, decorative lighting, canopy lighting. GloGreen 70W DHIDTM ballast replaces core and coil (magnetic) 100W- 150W ballast – application examples include underground parking, lowbay factory/warehouse (<25ft), street lighting, outdoor parking lot lighting, wallpack/building perimeter lighting, canopy lighting. GloGreen 100W or 150W replaces magnetic 150W-360W – application examples include highbay factory/warehouse/retail (<30ft), street/parking lot lighting, general outdoor/indoor applications. GloGreen 200W or 250W replaces magnetic 250W-450W – applications include highbay factory/warehouse/retail (<50ft) , street lighting, arena, event, airport, hydroponics, aquarium, general outdoor/indoor applications. GloGreen 400W or 575W or 600W or 750W replaces magnetic 575W-1500W – applications include highbay factory/warehouse/retail (50ft+), street/highway/parking lot lighting, arena/stadium, sports field, event, airport, hydroponics, greenhouse, aquarium, any general outdoor/indoor lighting applications requiring really long light throw/penetration. GloGreen 1000W replaces magnetic 1500W-2000W – applications include highbay factory/warehouse/retail (100ft+), street/highway/parking lot lighting, arena/stadium, sports field, event, airport, hydroponics, greenhouse, aquarium, any general outdoor/indoor lighting applications requiring extremely long light throw/penetration. GloGreen S DHIDTM products are designed to work most efficiently with solar/wind power sources. The DHIDTM ballast offers a very high electrical efficiency, converting the most Watts that are input into lumens output to the target (highest lumens per Watt ratio on market). The above substitutions yield instant 40%-50% or more savings in energy consumption; if dimming is utilized, the savings can equate to 75%+. The Digital HIDTM ballast lighting solution is the only on the market to operate both MH and HPS bulbs with equal efficiency. Each GloGreen Series DHIDTM ballast is fully silicon potted; completely sealed for harsh manufacturing environment or outdoor applications. With the World’s shortest ‘realistic’ return on investment time, the GloGreen Series Digital HIDTM lighting solution truly is free, it is only a matter of time. Please do not hesitate to contact us today to learn more about your energy and money saving opportunity. We look forward to the honour of partnering with you in your environmental and energy cost reduction initiatives. Today, more than ever there is a need for Industry to be responsible in its environmental judgements and actions. With the haste to improve the over-all environmental situation and push on Industry to reduce its carbon footprint, it is important to educate yourself on the short term and long term ramifications of the “Green” solutions you implement. In the case of lighting upgrades, there is a great opportunity to reduce corporation and municipality electricity expenses and more importantly to reduce the electricity demanded from the energy providers who are the greatest contributors of CO2 gases released into the environment. In selecting the lighting solution, be sure to investigate not only the short term purchasing costs, but also the long term costs associated with waste; i.e. labour costs due to installation, maintenance/cleaning and light bulb relamping. Lamp consumable or relamping expenses can be significant yet are typically not highlighted in the selling process of fluorescent (FLUO), LED and induction based lighting products. When considering the type of lighting for your new or retrofit high-bay or low-bay lighting application, it is essential to be aware of what long term costs will be incurred over the lifetime of the lighting system. One very important aspect to consider is the maintenance and labour costs associated with the cleaning and the changing of lamps. Fluorescent, LED and induction product’s light quality inherently suffers ‘visible’ degradation over the operating lifetime of the lamps, increasing the lamp replacement or relamping frequency and the over-all expenses of operating those systems. In regards to fluorescent, consider the long term costs associated with this lighting type; costs such as the installation, cleaning/maintenance, relamping and ballast replacements really effect the return on investment. This is especially important in applications where long light penetration and constant light levels are required over long periods of time (exceeding 30,000 hours); as in factory/warehouse, retail, and outdoor applications including street, highway and parking lot lighting applications. The following facts about DHIDTM lighting versus FLUO lighting serves to highlight the performance and the common costs associated with the installation and operation of each in the short and long term to help you accurately conclude your own realistic return on investment calculation. This is a direct comparison between both DHIDTM and fluorescent lighting solutions for a 40ft high-bay ceiling application where antiquated core and coil (magnetic) 1000W ballasts in existing HID fixture are already installed. The recommended Digital HIDTM retrofit solution is a dimmable 575W DHIDTM ballast powering a 575W Metal Halide (MH) bulb. The proposed fluorescent high output high-bay T5 solution features 8 lamps at 54W each and 2 non-dimming electronic ballasts. DHIDTM: A simple ‘plug and play’ retrofit of one digital ballast into the existing HID fixture and one new HID bulb installed where needed. The existing fixture is re-used and the efficiency is significantly improved by 50% to 75%. The performance and light quality is also better offering 40% brighter, whiter, penetrating light over the old system. The typical labour cost to retrofit a fixture is $50.00 US and takes approximately 30-45 minutes per fixture. The typical total package cost to retrofit a 1000W magnetic ballast application is $250-$300 US including the DHIDTM 575W ballast, light bulb and installation cost. FLUO: To install fluorescent you need to remove and recycle the used HID fixtures including ballasts, bulbs, reflectors, wires and the exterior metal housings. You then need to create new hanging structures for the new standard size fluorescent T5 8 Lamp high output fixtures. The lighting grid layout will need to also be changed as more T5 fluorescent fixtures will be needed to ensure a uniform light coverage (overlap) at the floor between them. In most cases, extra mid level or low-bay lighting needs to be installed where illumination from the fluorescent high-bay is not significant enough. There are also costs associated with the assembly of the individual fluorescent fixtures which is a labour cost the electrical contractor will invoice. With 8 bulbs and 2 ballasts, the complexity of a fluorescent system is high, adds cost and inhibits performance. The typical cost for a fluorescent T5 8 lamp high output fixture is starting at $280 US or more and this cost does not include the assembly/installation and the cost of the 8 lamps needed per fixture and for inventory. Luminous Efficacy and Lumens Per Watt Performance? DHIDTM: Luminous efficacy of 118lm/W for digital ballast powered Metal Halide (MH), High-Pressure Sodium (HPS) and Ceramic Metal Halide (CMH) HID bulb applications. If retrofitting an existing HID fixture which has an antiquated 1000W core and coil (magnetic) ballast, a new 575W digital ballast would be installed in place powering a 575W MH bulb for a new total fixture lumen output of 67,850lm (575W X 118lm/W). FLUO: Luminous efficacy of approximately 81lm/W if 54W bulbs in a fluorescent T5 8 lamp high-output fixture operating with 2 ballasts. If 54W bulbs offer a total lumen output of 4400lm output each, then 4400 X 8 lamps = 35,200 total lumen output from the T5 8 lamp high output fixture. Ballast / Fixture Efficiency Performance? DHIDTM: One digital ballast is 97% efficient. For the existing magnetic 1000W MH, we retrofit the 575W DHIDTM ballast operating a 575W MH bulb at 592W with 3% losses. At 575 Watts, the DHIDTM system will produce more lumens at the ground than both the existing 1000W MH and fluorescent consideration. Moreover, the notable increase in lumen output performance will bring the existing fixtures back to life, with more light at the ground, and with more light over-laps between the fixtures for a brighter white facility and working area. Due to the increase in the lumen output of the DHIDTM ballast high-bay installation, 30% to 40% of the existing mid level fluorescent lighting can be removed adding additional energy savings. And since the 575W DHIDTM can be dimmed, even more electricity savings are possible; e.g. instantly dimmed to 20%, the 575W ballast only consumes approximately 474W yet still outputs bright penetrating light to the target. FLUO: Two electronic ballasts are 90% efficient. Operating 54W x 8 bulbs = approximately 480W total with heat losses. Due to the poorer lumen output of T5’s, more fixtures should be added to the lighting grid to compensate for the lower lumen output to the ground. The 2 ballast design and the accumulation of 8 bulbs creates 10% losses to heat and increased wear on the bulbs leading to a more rapid degradation in light quality. The T5 fixture in this example does not have dim capabilities; to dim would add extra cost and complexity due to the ‘special’ dimming ballasts required. As a result of dimming fluorescent, there is also increased wear and tear on the lamps adding to lamp change increases and ultimately increased labour and consumable costs in the short and long term. Light Quality Throughout Bulb Life? DHIDTM: Due to Digital HIDTM’s 118lm/W luminous efficacy performance, more lumens, and natural white bright light penetrates to the facility floor. The light quality is guaranteed over the entire life of the bulb due to patented digital ballast technologies. The bulb does not degrade more than 5% from the life start to life end of the bulb creating huge benefits to retail, factory/warehouse or any applications where consistent bright white light is mandatory. The DHIDTM ballast increases the life of HID bulbs radically by 100% (or more if dimming is utilized). A bulb with an original mean time before failure (MTBF) rating of 20,000 hours will now last 40,000 hours or more and will suffer no less than 5% light degradation throughout the bulbs life. The high luminous efficacy of the DHIDTM ballast delivers brighter more penetrating lumens to the factory or retail application floor for less cost. Compared to LED, fluorescent, and induction based lamp systems, DHIDTM powered systems easily offer the best light quality/performance for the lowest total operating/consumable costs. FLUO: The fact is that all fluorescent lamps, be they hot cathode, cold cathode or electrode-less will suffer from phosphor degradation. The rate of this degradation is a function of the type and the amount of phosphor, and the type of glass used for the tube. The temperature of the phosphor and glass and the intensity of the UV flux from the discharge also play a role in enhancing the degradation of a fluorescent bulb. High Output (HO) and Very High Output (VHO) bulbs will normally degrade faster than standard output bulbs. Most standard output fluorescent bulbs claim 10,000 hours to 20,000 hours or more operating lifetimes, but can fall to 80% or less of their original light intensity after only 10,000 hours of operation. One must take into account the long term costs of this realistic bulb degradation and failure in considering fluorescent for your lighting application. If dimming ballasts are installed, please factor in this extra cost and also the increased cost of labour and consumables due to increased lamp changes as dimming has an adverse effect on the life of the fluorescent bulb, degrading it even quicker. Fixture Noise, Static; Light Quality Psychological Impact? DHIDTM: The proven DHIDTM ballast is silent, and operates warm as only 3% losses are to heat; the ballast is 97% efficient and does not create significant static electricity. Pulse start MH bulbs are inexpensive and produce a natural white light which is more pleasant to work under. Studies have shown that humans working in brighter, more naturally lit environments are more alert and more productive. FLUO: Some of the common nuisances end-users underscore about fluorescent lighting are the noise, the light quality/flicker, the colour, and rapid light quality degradation by or before the bulb’s mid-life and inevitably thereafter. Fluorescent lighting fixtures require increased maintenance and cleaning due to the dust that collects on the static charged surfaces of the system. The dust and debris accumulation on the bulb and on the reflector surface is unhealthy and further adds to the degradation of light quality and total lumen output. Lamp(s) and Ballast(s) Change Frequency? 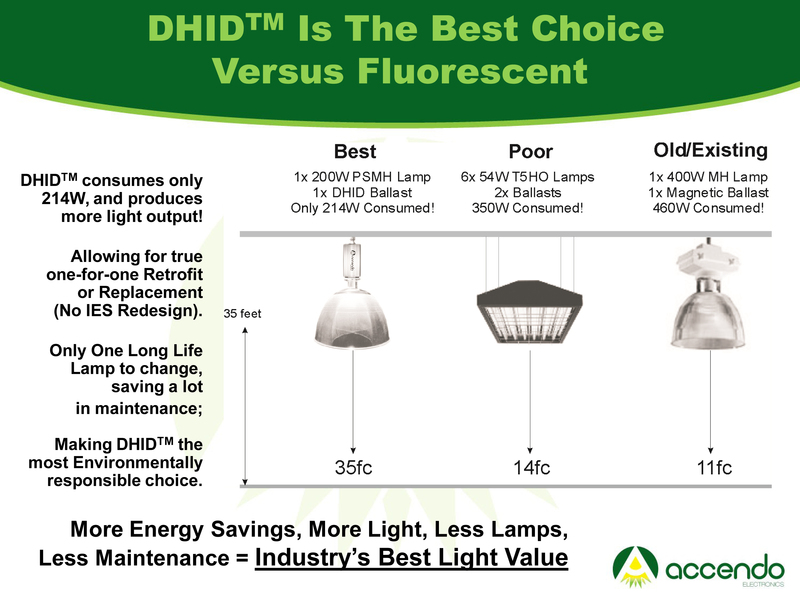 DHIDTM: Only 1 lamp needs to be replaced per HID fixture and with little labour cost/time needed as HID fixtures are typically easy to maintain with easy access to the light bulb. HID bulbs operated with the DHIDTM ballast are rated to 30,000 hours to 40,000 hours or more life expectancy (with dimming) and the bulb lumen output is guaranteed to not decrease more than 5% over the lifetime of the bulb. The DHIDTM ballast will output 118lm/W right up until the bulb’s life end. The DHIDTM ballast is rated to a 10 year MTBF and will output the same 118lm/W up until its life-end. At ballasts life-end, it is again a very simple and cost-effective replacement to upgrade the HID system without having to replace entire fixtures. FLUO: 8 lamps per fixture need to be replaced and much more frequently than DHIDTM which adds more labour and maintenance costs. If mean time before failure of the fluorescent bulb is 20,000 hours then lamps need replacement every 2 to 3 years. If the lamps are considered to be failed at 10,000 hours due to significant light quality and brightness degradation, then lamp change frequency needs to be every 1 to 2 years. Since the 8 lamp fluorescent fixtures need two ballasts each, then at the ballasts life-end two ballasts need replacement. If you factor in the labour costs to remove the old ballast and reinstall new ballasts, it becomes evident that a lot of waste is created due to the limitations of the fluorescent lighting technology. Long Term Realistic Bulb And Ballast Expenses? DHIDTM: Simple example: 1 bulb per existing fixture x 500 fixtures X $20 US approximate HID bulb cost for a 575W Pulse Start Metal Halide bulb = 500 bulbs at $10,000.00 US total every 4-6yrs+. Very simple procedure, 1 lamp to replace and it is easy to do in the existing fixtures since the bulbs are really easy to access. This decreases the maintenance labour costs noticeably. The DHIDTM ballast is rated to 10 years MTBF and is also easy and cost-effective to replace at that time. FLUO: 8 x T5 high output bulbs X 500 units = 4,000 bulbs. At an approximated bulb price of $5 USD X 4,000 bulbs the total bulb consumable costs alone is $20,000 US. If the bulb lasts 15,000 hours without significant degradation, you would incur this expense every 2 years approximately. In addition, there will be increased labour costs incurred to change 8 lamps per fixture. At the end of the ballasts life there will again be expenses incurred to replace either the entire fixture (more waste), or to retrofit two new ballasts in the existing fixture. Either option with fluorescent will result in inevitable labour and consumable expenses and environmental waste. DHIDTM: It is possible to dim Metal Halide, High-Pressure Sodium and Ceramic Metal Halide HID bulbs with DHIDTM digital ballasts. Dimming is simple and instant and it adds to the already sizeable savings in energy consumption since the DHIDTM ballast can dim the HID bulb from 100% power to 50% power or any step in between this range. The dimming of a DHIDTM ballast powered bulb is barely noticeable because the system still delivers high lumen output in the dimmed state. With smart dimming, the electricity costs to operate the system are further reduced without disrupting the operation or safety of the working environment. Motion sensors are strategically placed to detect human and operator activity to determine lamp on times at full power. In the case of a 575W DHIDTM ballast powered HID bulb replacing a magnetic 1000W system drawing 1200W with approximated heat losses, the end-user can expect 50% or more savings without dimming. The system can then be dimmed down via motion sensor or switch by 20% to the 460W setting for the additional 20% in savings in electricity (1200W – 592W – 118.4W = 489.6W / 1200W = 59%+ savings total). With the advancement in the DHIDTM technology over magnetic based HID systems, lamp start times are 1 minute, dimming is instantaneous and start-up after a hot re-strike is 3 minutes. In most Industry applications, instant dimming capabilities are preferred since HID lighting systems are typically installed in areas where the lights are to be on for extended time periods. Where it is essential to have the lights on always, the dimming of a HID system is ideal since lumen output is still high in the dimmed state, yet more electricity is saved since the lights are only at full power when needed. FLUO: Yes and No; it is possible to dim fluorescents, but you need special and expensive ballasts with this capability for T5 fluorescent bulbs. This adds expense as you need two ballasts per each 8 lamp high-bay fixture. Without dimming there is a great limit on electrical energy savings possible with fluorescent lighting. One should also consider the original lumen output performance when considering the fluorescent solutions versus a DHIDTM retrofit solution since DHIDTM offers a much higher output of lumens to the target, even in the dimmed state. Secondly, one should consider the effect of dimming on the fluorescent bulb since increased dim-on and dim-off cycles reduce the bulbs life. Fluorescent lighting was not originally designed for dimming, and is typically not recommended due to the associated expenses, performance limitations and poor return on investment. DHIDTM: With DHIDTM the short term return on investment payback is 0.5 years to 1 year for a total DHIDTM retrofit package including bulb, ballast and installation. In the long term, if utilizing an MH bulb with a MTBF of 30,000 hours to 40,000 hours+ with dimming, operated at 6,240 hours yearly, the bulb would need to be replaced every 4.8 years or 6.4 years+ with dimming respectively. At a bulb cost of $20 US, the total consumable cost is miniscule over the lifetime of the system. The DHIDTM ballast is rated at 10yrs MTBF with the potential to have its life extended further depending on the application. With fewer bulbs and less frequent lamp changes, maintenance/cleaning time is more infrequent making the money saved in labour and consumable expenses over the system life noteworthy. The DHIDTM solution guarantees high energy efficiency, and high-quality, penetrating light over the entire lifetime of the bulb and the DHIDTM ballast. FLUO: The short term return on investment payback time is poor due to the initial cost of purchase and installation; i.e. the labour to assemble the new T5 8 lamp fixtures; the removal of the used HID fixtures; the install and wiring of the new T5 fixture; the installation of the 8 lamps and the accumulated costs of all the fixture hardware and individual lamps for each fixture. Furthermore, in the short term one must factor in the costs of how frequently the fixtures will require cleaning due to decreased light output as a result of dust accumulation. If the T5 high output bulb is able to last 15,000 hours without noticeable degradation due to cleaning and efficient bulb operation, then bulb change labour and consumable expenses will be frequent; every 2 years or less making the return on investment of fluorescent over the long term (5 years or more) most unfavourable when compared to the DHIDTM retrofit solution. The DHIDTM ballast retrofit solution is the most environmentally responsible and cost-effective upgrade for inefficient lighting installations. By simply retrofitting the Digital HIDTM ballast into an antiquated HID lamp system, the old fixture is re-used and rejuvenated, bringing new life and a drastic improvement in performance to the HID bulb based system. This simple procedure leaves only the old HID bulb to be recycled (and ballast in circumstances) and therefore creates much less strain on the environment. The cost-effective DHIDTM solution is able to reduce Industry’s carbon footprint; reducing over-all CO2 emissions released into the atmosphere due to the measurable amount of energy consumption and waste reduced as a result of the simple DHIDTM lighting upgrade. Digital HIDTM lighting promises and delivers the optimal balance of energy efficiency, light quality/performance, and reduced maintenance benefits for the shortest realistic return on investment payback time in the Industry. We welcome the opportunity to discuss our findings with you further; please do not hesitate to contact us with any questions. Industry can be more competitive and environmentally effective today by significantly reducing the costs and electricity consumption associated with the operation of lighting. By replacing antiquated lighting systems with high performance energy efficient Digital High-Intensity Discharge lighting (Digital HIDTM or DHIDTM), 50%+ less electricity is consumed and demanded from the power utilities; cost-effectively reducing Industry’s carbon footprint. When considering the upgrade of an existing HID lighting system or lighting for new Green Building projects, DHIDTM technology delivers the most energy efficient lighting solutions for Street Lighting, Factory/Warehouse High-Bay Lighting, Greenhouse Hydroponics, Sporting Arena, Airport and Renewable Energy Applications. Any existing core and coil (magnetic) ballast HID application can benefit immediately just by retrofitting the old magnetic ballast with a new DHIDTM ballast. From an environmental standpoint, by reusing the existing light fixture and lens assembly, less waste is created and money is saved since only a new ballast need be purchased, leaving only the old ballast to be recycled (we partner end-users with recommended magnetic ballast recycling companies). DHIDTM‘s value-added features and performance make it the smart solution for any new installation; it is the most cost-effective alternative to LED, Fluorescent and Induction based technologies for new and retrofit industrial and commercial Green lighting projects. Digital Ballasts offer unparalleled electrical efficiency and performance compared to conventional magnetic ballasts and outperforms LED, Fluorescent, and Induction lighting in initial buying cost, energy efficiency, system performance, light quality, and maintenance/consumable costs. With an industry leading luminous efficacy of 116 Lumens/Watt, conventional higher Wattage magnetic ballast HID lighting fixtures are now easily upgraded/retrofitted or replaced with the new higher-performance, yet lower wattage DHIDTM Digital ballast or fixture. For example, a conventional 1000W Metal Halide magnetic ballast, can be retrofitted with the DHIDTM 575W Digital Ballast offering an immediate and significant 50% energy savings and approximately 18% brighter light. Add the ability to dim the Digital HIDTM Ballasts, and even greater energy savings can be realized. Using Automatic Dimming or pre-programmed schedule dimming to dim lights on daily set schedules can reduce your project electricity operating expenses by 75%+. – Automatic loss-of-lumen compensation as lamp ages; lamp quality brightness will degrade only 5% over the entire 30,000hrs+ MTBF of the MH, CMH or HPS bulb. 95% Lumen Maintenance = No Relamping! – Increased life expectancy (100%) of the lamp compared to core-and-coil (magnetic) ballast technology. – Highest efficiency ballast on the market: 97%, DHIDTM Digital HIDTM ballast generates minimal heat – this improves the efficiency of HVAC and Refrigeration systems in building and warehouse applications. – 1%-70% dimming of incoming power produces additional cost saving. – Multiple dim modes: motion sensor/PLC dimming with discrete or Analog 0-10VDC signal; onboard (Automatic) pre-programmed dimming maximizes electricity cost savings. – Conventional core-and-coil (magnetic) ballasts create significant heat and operate at a 25% loss in terms of Watts consumed and Watts produced. Outperforming LED, Fluorescent and Induction lighting technologies, DHIDTM Digital Ballast powered HID lighting is proven to be the value-added lighting solution. DHIDTM’s low initial buying cost, energy efficiency, system performance, light quality, and reduced maintenance/consumable cost benefits add up to the industries best return on investment time. We welcome the opportunity to discuss our findings with you further; please do not hesitate to contact me with any questions. Lighting Up The World, Responsibly..
-> 95% Lumen Maintenance = No Relamping!